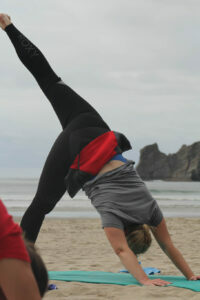 I started practicing yoga about 25 years ago, a few years after I had started to surf. Along my life path these two practices have been parallel in my personal development and spiritual understanding. They have benefited and complimented my expansion and wisdom of life. From East India, ancient Hinduism shared with the World the practice of Ashtanga Yoga, the eight limbs of yoga which explores the wisdom filled layers of Being a conscious and enlightened human. Modern day practitioners can begin on the path of yoga with faithful daily asana (postures), pranayama (breath practice) and meditation. The expression heard in Western yoga classes at the end of class as well as on the streets of Delhi, Namaste’ means I honor that place in you in which the entire Universe dwells. I honor that place in you which is of love, of light, of truth and of peace. When you are in that place in you, and I am in that place in me, We are One. Aloha and Namaste’ both recognize the god-like quality in the other. Mindfulness is an essential part of each practice in both traditions as well. When you paddle out to catch a wave or transition on your mat to half moon pose (ardha chandrasana), each requires your grounding, attention and then presence brought to what is happening in that moment (GAP). Without that you won’t line up in the ocean properly to catch a wave and you won’t be able to connect to your foundation to effortlessly stack your hips and lift up and out into the pose. 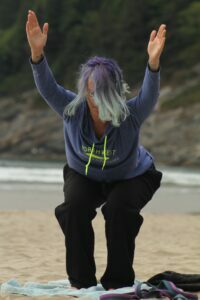 Being distracted and “mindless” will only serve you to miss waves, get sucked down the beach with the current and fall out of the pose you are moving into. 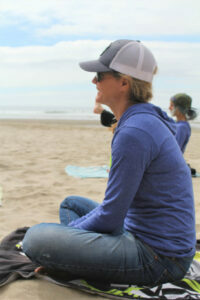 A deepened sense of observation, perception, awareness and inner connectedness exists between surfing and yoga. As you become a surfer, your sense of all four develops and allows you to have a “consciousness” of the experience of paddling and catching waves in the ocean environment. The more you surf and are present in each session, the more your mindful presence matures offering you a heightened sense of santosha (contentedness in ancient yogic Sanskrit). 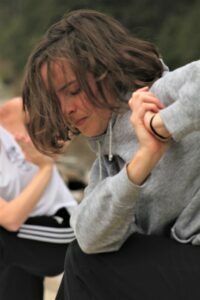 In yoga, when you are practicing on your mat, beginning by just “sitting” transitions you to a more conscious inner awareness which then when you balance your breath with your asana (poses) also offers a sense of bliss. This ancient strand runs through surfing and yoga on both a spiritual level and in daily mindfulness practice. 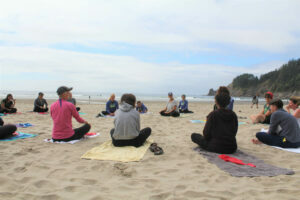 Mindfulness Beach Yoga Circle in each camp event we offer.